For anyone whose head has been buried in the sand Pokemon means pocket monster and has been a craze amongst younger people for the last 3 years or so. Essentially, Pokemon is a generic term given to creatures classified as pocket monsters. Pokemon can be captured by human trainers and used for all manner of things, including friendship or to battle on behalf of their trainers. The Pokemon series mainly follows the adventures of young trainer Ash and his favorite Pokemon Pikachu who is a yellow dog/cat hybrid. All Pokemon have unique abilities and this adds to the beauty of the series. However there is one Pokemon that is unique called Mew. Mew is the most powerful Pokemon on the planet. That is until some evil scientists clone Mew and create Mewto to participate in some super Pokemon showdowns that could affect the fate of the whole world! Quite possibly for some viewers this movie will not do much for them. You will for the most part just be viewing exactly what you could watch every morning on the cartoons. For us Pokemon fans though, it is another fantastic romp through Pikachu's world! Utilising Dolby Digital, this movie sounds fantastic. 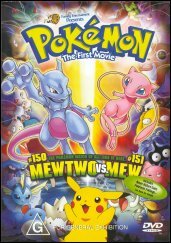 With a barrage of extras, the DVD is sure to impress anyone even vaguely interested in Pokemon. Can Ash, Pikachu and co stop the menace of Mewto before it's too late?